When it comes to Indian street food, sev holds a very special spot. 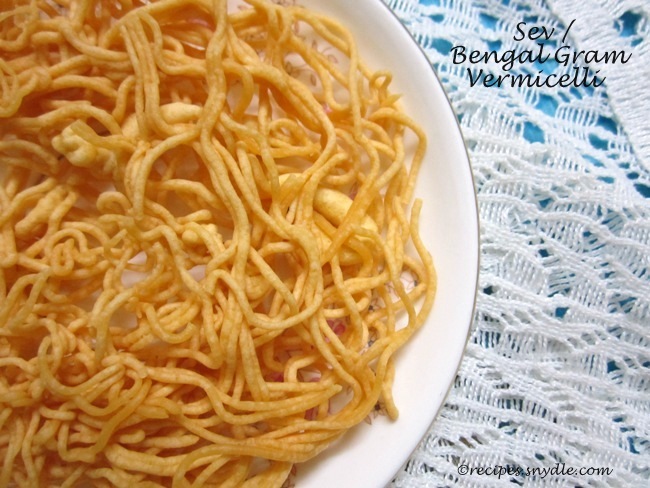 It looks a lot like vermicelli and is made from besan or bengal gram flour. You can find a lot of varieties of sev; thin, thick, salty, spicy, sets-my-mouth-on-fire- spicy etc. 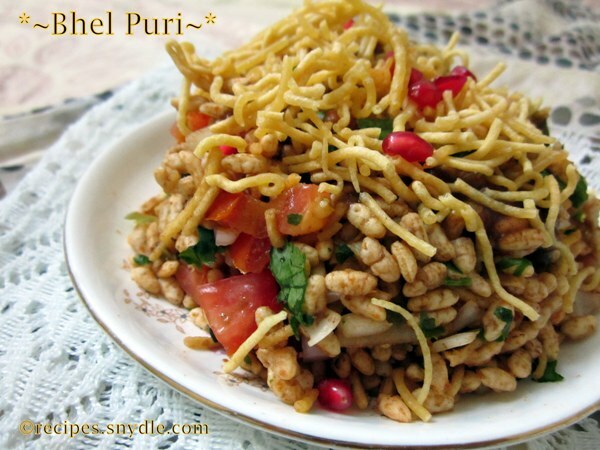 It makes for an amazing garnish for bhel-puri, sev-puri, ragda-pattice and many more delicacies. Sev can be had as is. It tastes equally delicious as you munch on it without any accompaniment. I used it in making bhel puri. 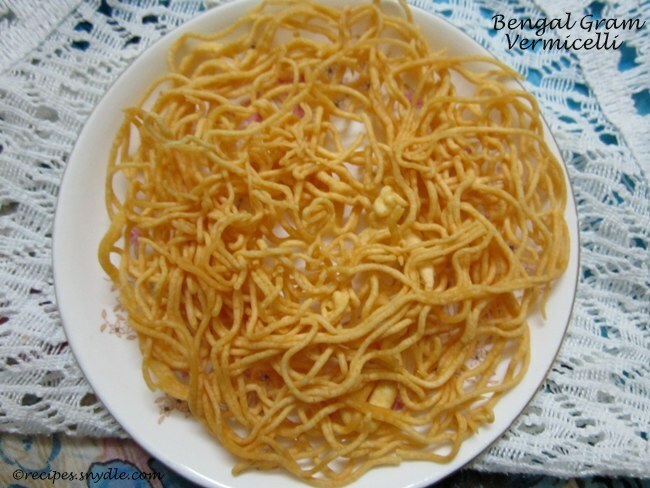 The recipe I am sharing today makes sev that is neither very thick nor very thin. It’s medium in thickness, nevertheless very crunchy. Besides, you can use the unsalted version to make sev barfi. To make sev and chakali, we get a special type of press machine in the market. It’s usually made from steel or brass, and it consists of mould of different sizes. So when making this sev, you choose the mid-sized mould as shown in the picture. For the purpose of measurement, 1 cup = 250 ml. Now let’s get started with the recipe. In a mixing bowl, sieve the gram flour. Add in the salt and red chili powder and mix it using a spoon. Add in water, little by little and keep mixing so that no lumps are formed. The batter should be soft and paste-like. Lastly add in the hot oil and give it a good mix. The batter is ready. Grease the insides of the container of the sev press machine with some oil. Heat enough oil in a skillet to deep-fry the sev. In the meanwhile, fix the mould plate in the bottom of the machine. Spoon in the gram flour mixture and put on the lid. When the oil is hot enough, turn the flame to low. Hold the machine over the skillet. Rotate the handle to squeeze the sev batter from the mould. Revolve the machine over the skillet as you do so. You will get a circle of sev as shown in the picture. Do not make very big circles of sev, else they would turn out very thick and all stuck up together. Fry the sev on low to medium till it turns golden brown and crispy. Remove the sev on a kitchen towel to drain the excess oil. Repeat the process with the remaining sev. You will get about 4 to 5 sev rings. Allow the sev to cool down and then gently break the circle so that you get about an inch-long individual pieces of sev. Store it in an air-tight container. Sev stays good for about 7-8 days. 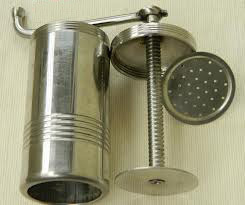 Use it in making chaat preparations or to munch on as is.